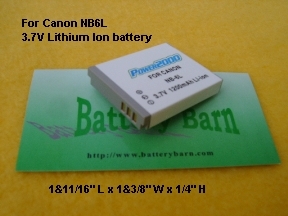 Item Number: AC-NB6L for Canon NB6L battery. Canon IXY 25IS, 25 IS, NB6L battery. Dimensions - 1&11/16" L x 1&3/8" W x 1/4" H.